When you walk into Wolff’s this time of year, a sea of vibrantly colored flowers greets you. Some of these plants are ready to go in the ground, like Pansies and cold-tolerant annuals like Alyssum, Diascia, Dusty Miller, Lobelia, Nemesia and Snapdragons. Other early season perennials are also waiting for their turn in the dirt, like Lithodora, Papaver and Pulmonaria, and some plants need to stay on your windowsill until the threat of frost has passed. In order to have the most prolific garden, good planning is required. The first step is to determine what you want from your garden. 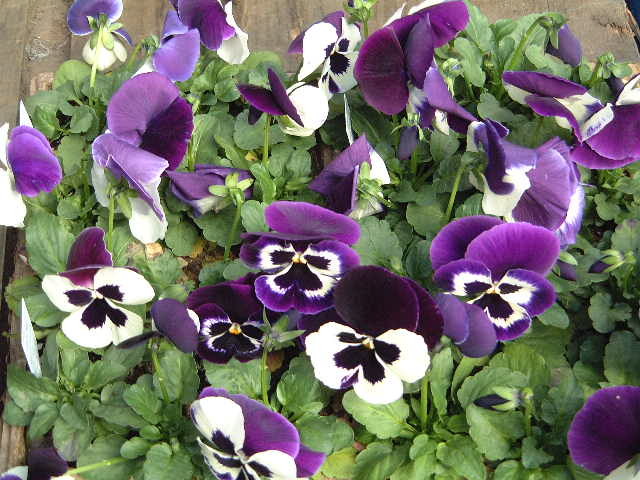 If you want to plant flowers now and enjoy them until the heat of summer comes, then pansies are the ideal flower for your garden. They are in full bloom now with beautifully bright colors and are one of the best flowers to help fill out your flowerbeds this time of year without having to worry about any damage from a cold snap. The sooner you get them in the ground, the more they will flourish throughout the spring. It’s even possible to keep your pansies alive all summer if they are in a shaded area and get plenty of water! If you’d rather wait a few weeks to plant, you can choose more hardy mid-spring flowers until it’s time to make room for drought-tolerant summer flowers. Some flowers, like Gerber daisies make great houseplants now to brighten up your home and can be planted in the ground by early May. Stay tuned for more information on these mid-spring flowers. If you’d prefer to plant perennials that require less maintenance, you can start with our early season perennials such as Lithodora, Papaver and Pulmonaria. Maybe your garden already has some perennials and needs just a few more to round it out. If so, count on finding perennials at Wolff’s from March to November. If it’s a produce garden you’re longing for, we already have hundreds of unique fruit, vegetable and herb plants. By the end of April, we’ll have over 160 varieties of tomatoes and over 80 varieties of peppers, including many organic and heirloom varieties! All of our herb plants are arranged alphabetically so that you can easily find the herb variety you are looking for. Our cold tolerant vegetables that are ready to be planted now are grouped together in our store. Less hardy vegetable plants are also available and can start growing strong on your windowsill now. For the fruit enthusiasts, we have blueberry, blackberry, huckleberry and raspberry bushes as well as several varieties of strawberries. And if you have limited ground space for gardening, we have plenty of options for container gardening and houseplants. We have a wide variety of 14” cool season color bowls and 24” cool season window boxes including pansies, violas and our cold tolerant annuals and perennials. This week we have a great selection of Easter flowers, and will continue to get more the next two weekends. Whether you’re ready to plant your garden or not, now is a great time to be out preparing the garden. Take time to prepare your garden. Plan out your gardening goals. Get the soil ready by tilling the ground and adding in fresh potting soil. Start composting your kitchen scraps and yard trimmings. Start now and enjoy the benefits of your garden in the weeks to come!